This help article will walk you through how to include dynamic articles, meaning you can apply rules which will send the recipient the article that meets the criteria. This feature works similar to dynamic content blocks. Once you have attached the email to the campaign you are able to select the articles that you wish to use. Simply click on the 'Articles' button that is highlighted above. Please Note: You can only attach articles to the campaign if an article block is included in the creative email. If you would like to set certain rules to the article block you can do this by clicking the button indicated in the above picture. Please Note: If you are setting rules based on article blocks, it could lead to gaps in your email if the rules are not met. 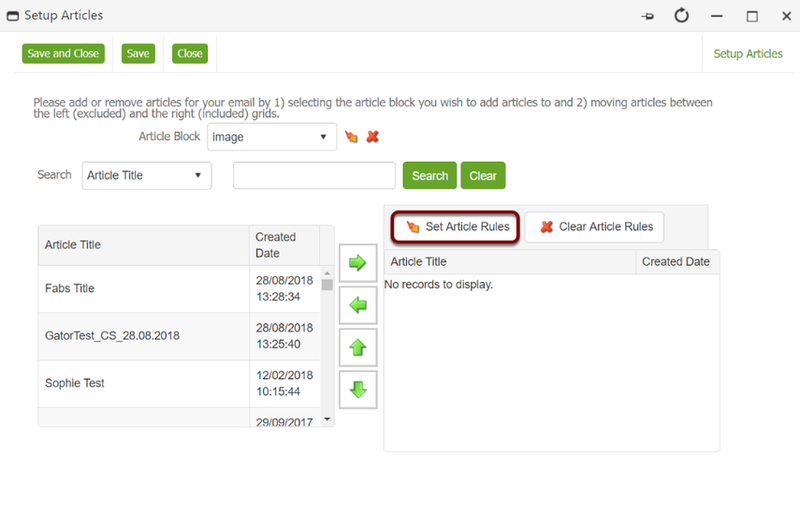 You will then be taken through to the section where you create the rules for the article block. Add Rule- Click add rule, this will then expand the section and will enable you to select the rules that you would like to use. Attribute Name- The attribute name is the business object that you would like to use to segment your audience by. To select the attribute, click on the attribute name field which will provide a list to choose from. Operator- If you click on the drop down below operator you will be able to select the metric that you measure this by i.e. is like, equal to. Value- Enter the value that you would like to apply the criteria for. And/Or- If you would like them to meet multiple rules click the And rule if they only need to meet one of the criteria select OR. If you would like to add additional rules click add rule and this will place the rule below the one you have just created. Once you are happy with the rule click Save, then click Close and you would have successfully created a dynamic article block rule.